Deir Al-Adra (sometimes referenced as Deir al-Adhra, both meaning 'monastery of the Virgin') stands on the Gabal Al-Tayr (sometimes referenced as Jebel el-Teir, both meaning 'Mountain of the Birds'), Markaz Samalut. 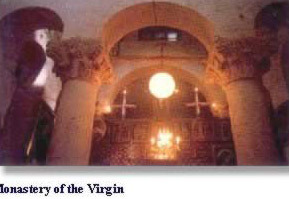 This is an old Monastery/church built by Empress Helena in 328 on the site where the Virgin, Christ and Joseph, the Carpenter, stayed during their flight to Egypt It is about 58 miles south of Beni Suef and just east of the city of Samalut, situated on a hill on the east bank of the Nile. Faithful pilgrimage here between January 29th and August 22nd. To the north are ancient quarries and a low relief of Ramesses III. Just south are the Frazer Tombs, which date to the 5th and 6th Dynasties. There are four tombs are simple, and built into the desert cliffs.